The Whitney Studio Club and Galleries Collection, a project funded through the generous support of the Leon Levy Foundation, brings together 998 of the Whitney Museum’s earliest documents. In 2010, archives and exhibition publications from the Whitney’s pre-history were digitized, in an effort to both increase the visibility of these records and to preserve fragile primary source documents. 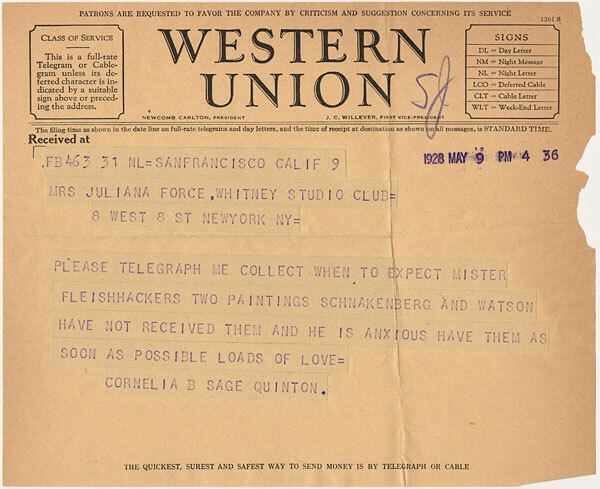 Archival records, photographs, checklists, and catalogs from exhibitions organized by Gertrude Vanderbilt Whitney and Juliana Force—respectively, founder and first director of the Whitney Museum—were scanned to create high-quality digital files. The Frances Mulhall Achilles Library at the Whitney Museum of American Art serves as a comprehensive research collection in the field of twentieth-century and contemporary American art. It was originally built on the foundation of Gertrude Vanderbilt Whitney’s personal collection of books and papers. The Library provides researchers a gateway for easy access to a wide range of research materials through the electronic catalog, WhitneyCat, which contains the bibliography of the Whitney’s reference collection of over 40,000 books, exhibition catalogs, and periodical titles. In addition, the Library’s holdings include the Special Collections, vertical files, and the Museum Archives.